And then four months went by without a post. You see, I’ve been really, really busy. Non-stop busy. Like, every morning and every night – you might as well not even try inviting me anywhere, it’s that bad. You see, I’ve been rereading the Harry Potter series? I finally got to the point where, six point five years after the last book’s release, I wasn’t understanding the Harry Potter references in the comments on BuzzFeed anymore. I couldn’t remember what spell went to what and while I could remember what major characters died when, I couldn’t remember why or how. So obviously, 2014 priorities = Harry Potter. Q1, anyway, once I brought my copies from CA to NY after New Year’s, uninterrupted but for a two week break during which I read Dave Egger’s The Circle (want to get freaked out by the Internet/consider never blogging/tweeting/searching again? Try that one). I still love these books. I’m as wrapped up in them as I ever was as a kid. Except this time around, I have the occasional glass of wine while crying at death by magic. I have one book to go. And then about 24 hours worth of movies to watch. I titled this post 2014 because I had this thought that in January I’d write a post and call it “January.” I’d call the next one “February,” and obviously it goes on. But now it’s March 3 so just in case I slack, this title covers me. 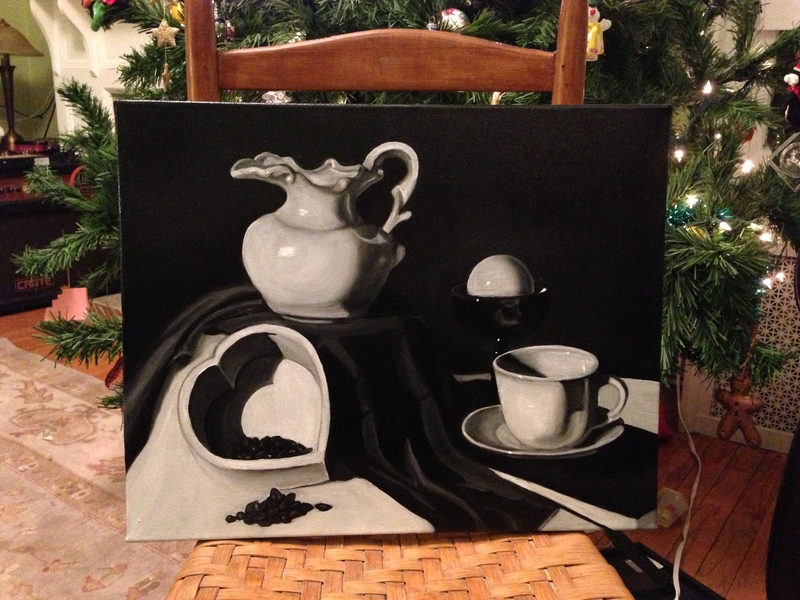 Just to backtrack for a minute, back when it was still 2013 (and Christmas-time), I finished my painting! I was at a party the other night where a few people talked about how I used to have this great blog and I used to talk about all these crazy travels. Like when 2 euros led to awkward eye contact in Amsterdam. And when I accidentally went to Warsaw. Does anyone pay attention to a website’s homepage slideshow? Will you watch my client’s 90-second video? What if it was two minutes long? What’s your attention span? Is there value in real-time marketing or is it just getting silly and unnecessary? Why can’t I break 627 Twitter followers? But then there’s other real-life concerns. Is it wrong I named my fish that randomly turned white this week Michael Jackson? What will I read after I finish Harry Potter and the Deathly Hallows? How & when does one practice darts so that she doesn’t embarrass herself next time she’s at the bar with friends? What’s my Capital Region spring bucket list going to look like? How does one get a children’s book published these days? What makes flavored seltzer so delicious if there’s no ingredients on the label? Will I regret my seltzer stockpile someday? If I want to eat healthy, that means a gabillion carrots is an okay snack, right? When will I ever pick a password for anything that I’ll I remember the next time I need it? These are the random thoughts at 8:34 p.m. on a Monday. These are what bring me back to my blog tonight – these and the fact that spammers have recently found the need to comment twice daily on my Freshly Pressed Budapest post and I had to do some cleaning up. But now it’s time to wrap up a few things, grab the Half Baked and read some Harry Potter. Back again, soon.